Inauguration of the new scenography of the provincial museum of Battambang after the resettlement of the collections of sculptures, restorations and restoration on pedestals, conducted by the National Museum of Cambodia with its conservation workshop. In the group gathered around the minister Ms. Phoeurng Sackona, the director of the national museum, M. Kong Vireak and the location manager Huot Samnang: Sreymom, Soda, Chea Socheat, Phy Sokhoeun and the young Sopheak (master 1 Inalco). The director of the EFEO paying his respect to his majesty Norodom Sihamoni, King of Cambodia, on the occasion of the gala dinner offered by the national authority Apsara in Angkor (Elephant Terrace), for the 25th Anniversary of the International Coordinating Committee for the safeguarding and development of the historic site of Angkor (UNESCO), December 5, 2018. 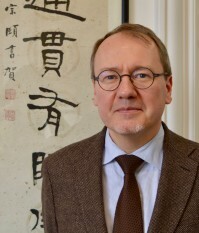 Christophe Marquet, director of the EFEO, and Pirapon Pisnupong, director of the Maha Chakri Sirindhorn Anthropology Center in Bangkok, Thailand, signed on Monday, December 3, 2018 a MOU which formalizes the scientific relations with this institution that hosts the Center of the EFEO since its creation in 1997. 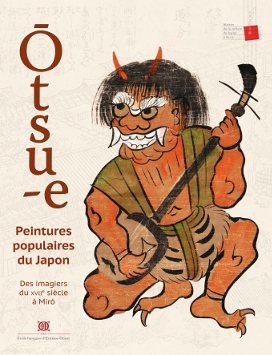 As part of the European Salon des Métiers d'art RESONANCE[S] Christophe Marquet gives a lecture: The Japanese popular imagery Otsu: a forgotten art and its renewal from 17h to 18h30 at Parc Expo in Strasbourg.